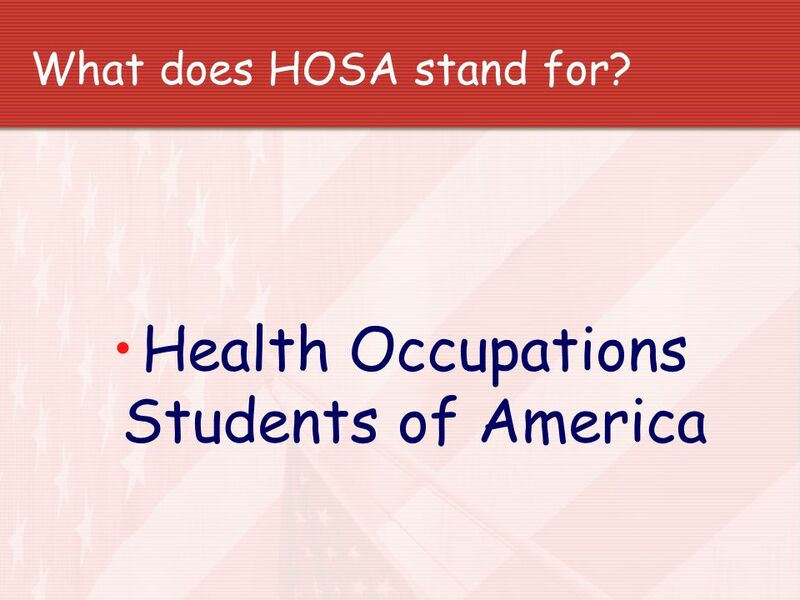 2 What does HOSA stand for? 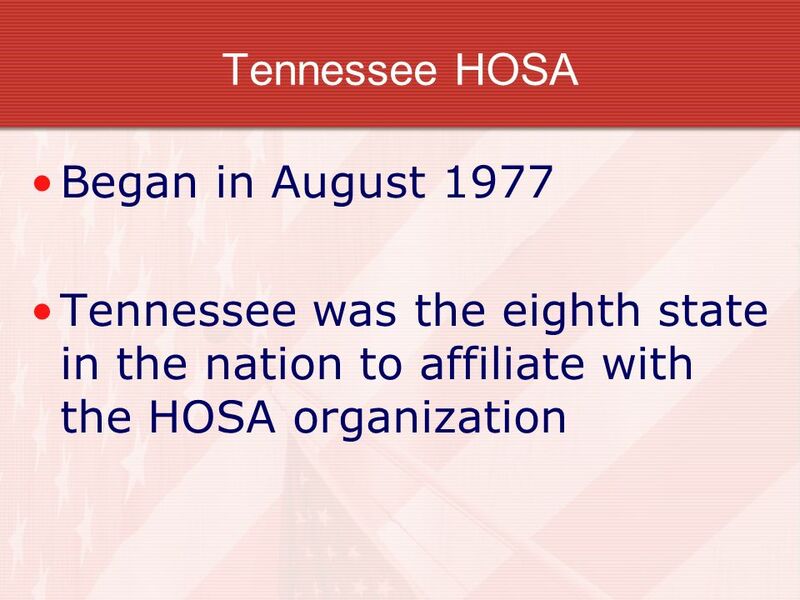 3 What is HOSA? 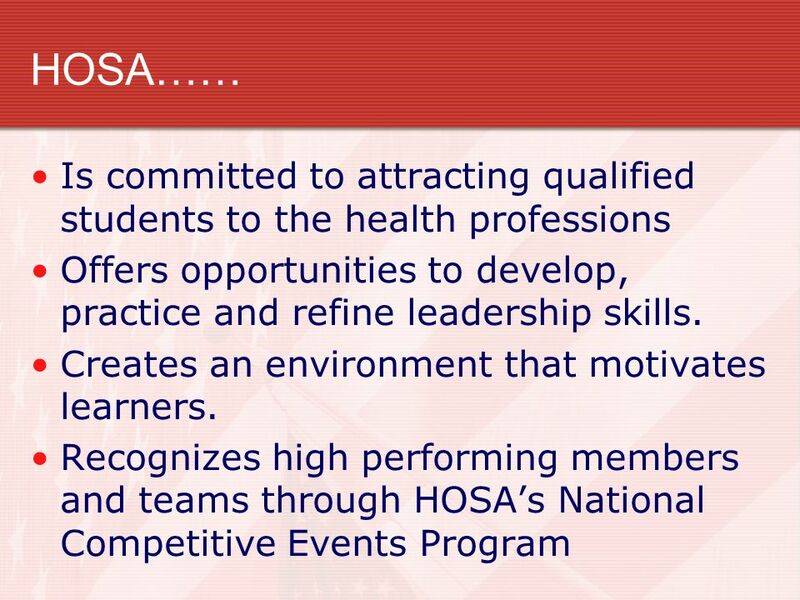 HOSA is: National student led organization for career and technical education students who are interested in or are pursing a career in health professions Endorsed by US Dept of Education & Association for Career and Technical Education . 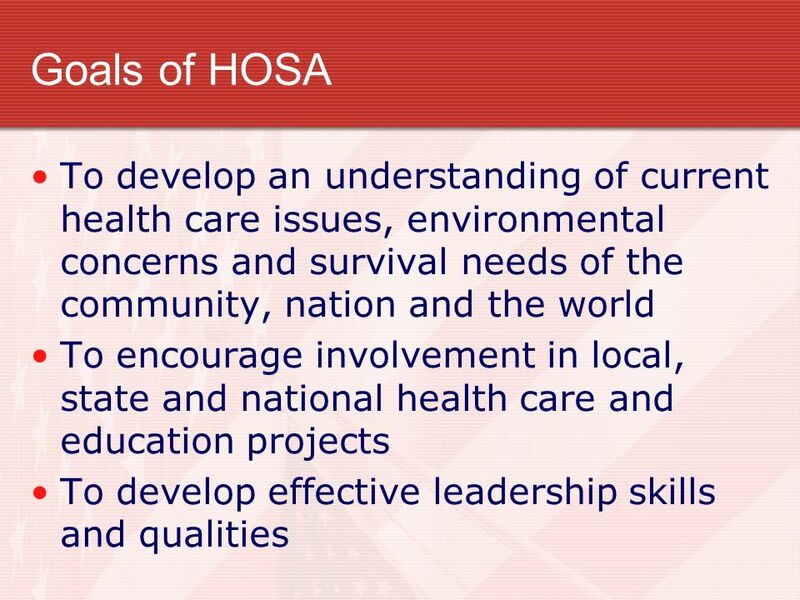 6 The Hands of HOSA Mold the Health of Tomorrow. 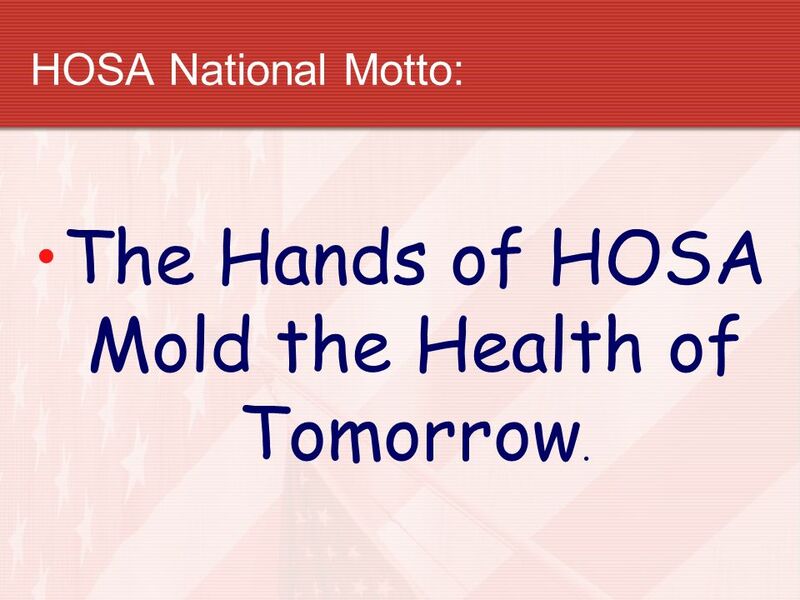 HOSA National Motto: The Hands of HOSA Mold the Health of Tomorrow. 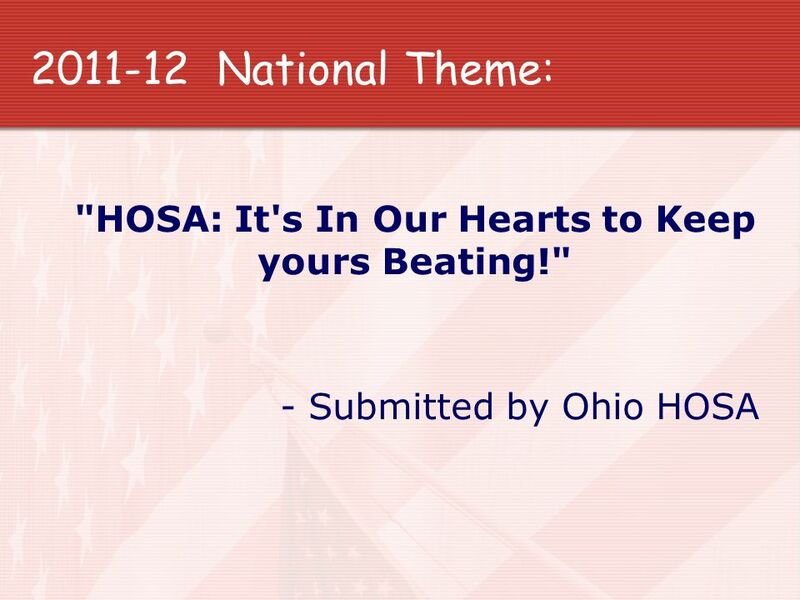 7 "HOSA: It's In Our Hearts to Keep yours Beating!" 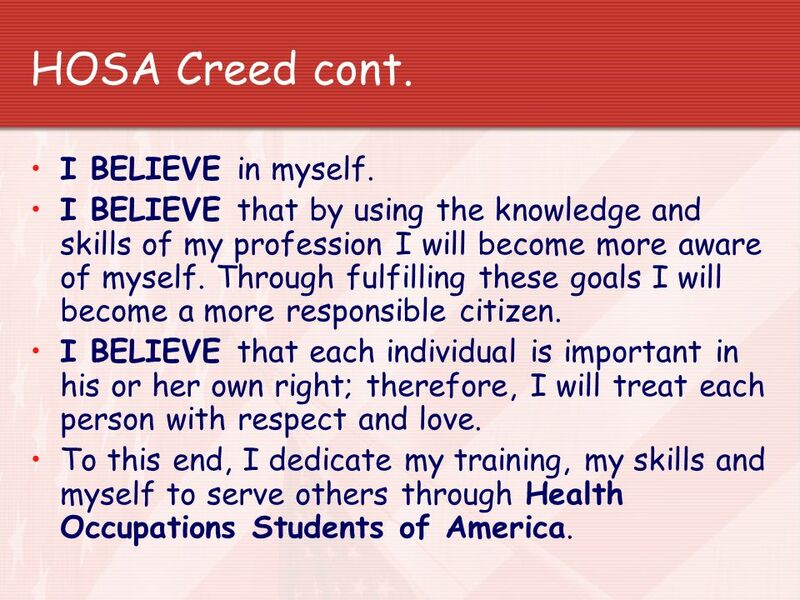 9 HOSA Creed I BELIEVE in the health care profession. 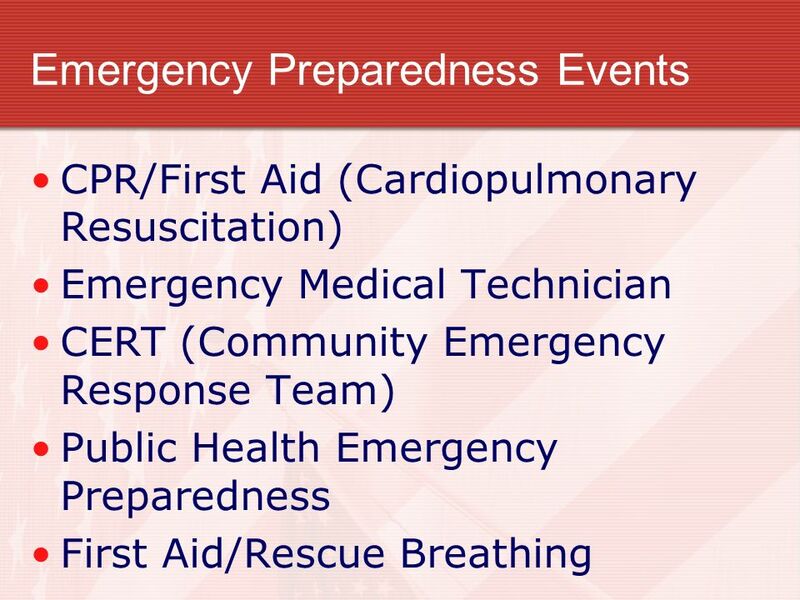 I BELIEVE in the profession for which I am being trained and in the opportunities, which my training offers. I BELIEVE in education. 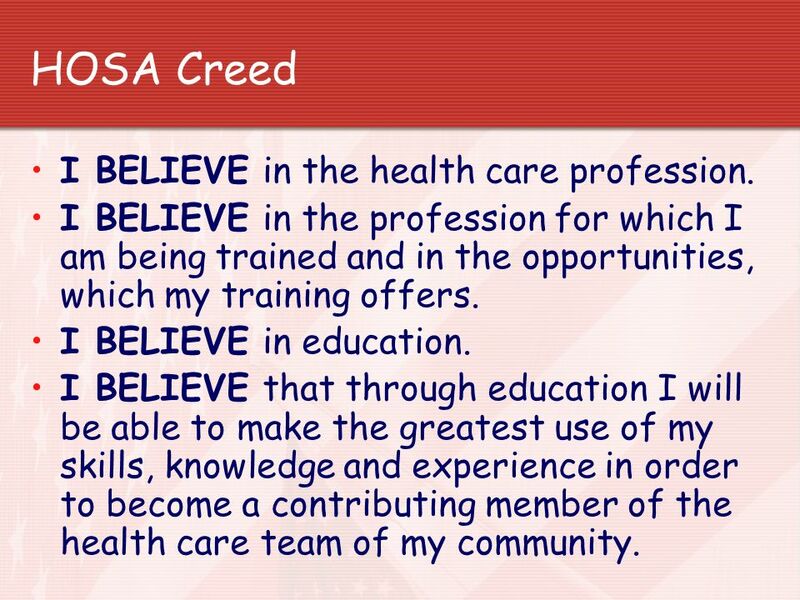 I BELIEVE that through education I will be able to make the greatest use of my skills, knowledge and experience in order to become a contributing member of the health care team of my community. 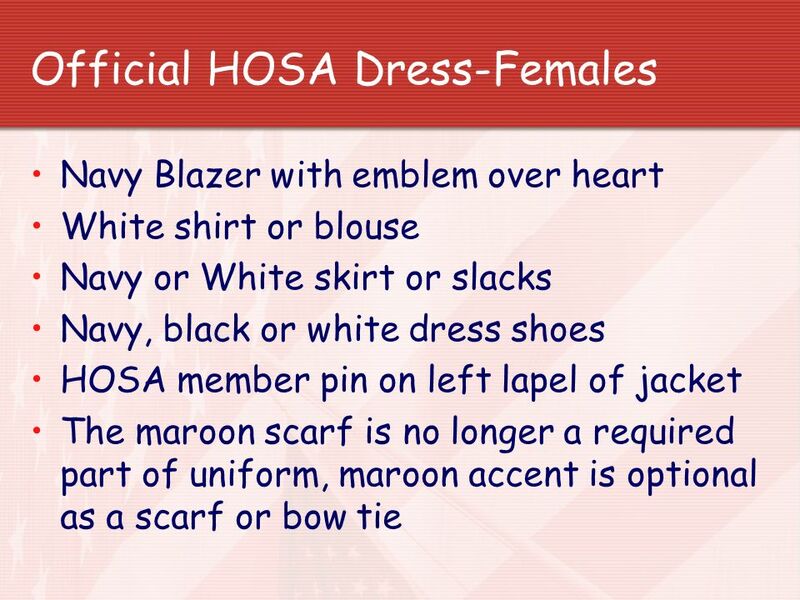 10 HOSA Creed cont. I BELIEVE in myself. 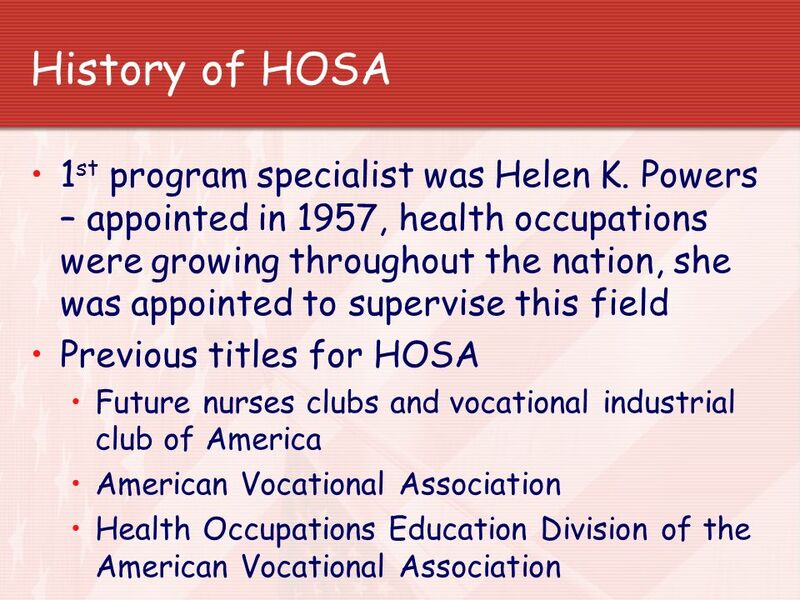 I BELIEVE that by using the knowledge and skills of my profession I will become more aware of myself. 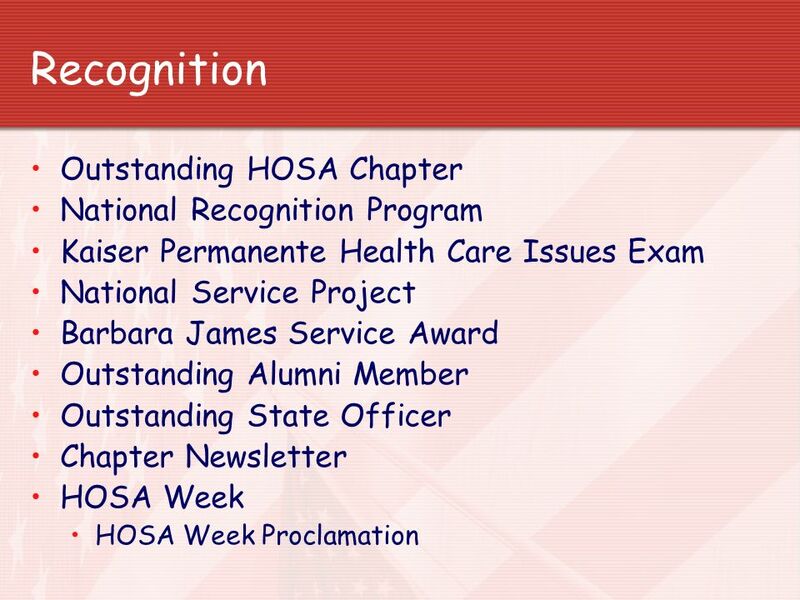 Through fulfilling these goals I will become a more responsible citizen. I BELIEVE that each individual is important in his or her own right; therefore, I will treat each person with respect and love. 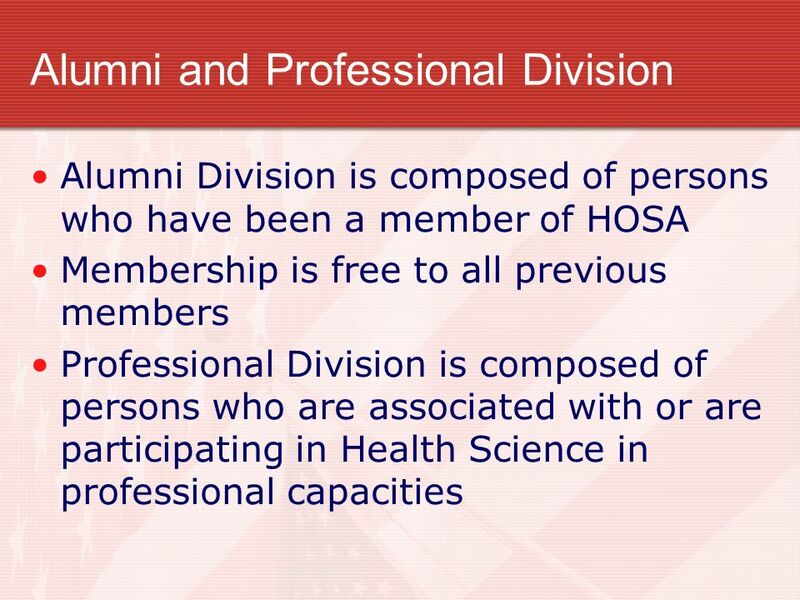 To this end, I dedicate my training, my skills and myself to serve others through Health Occupations Students of America. 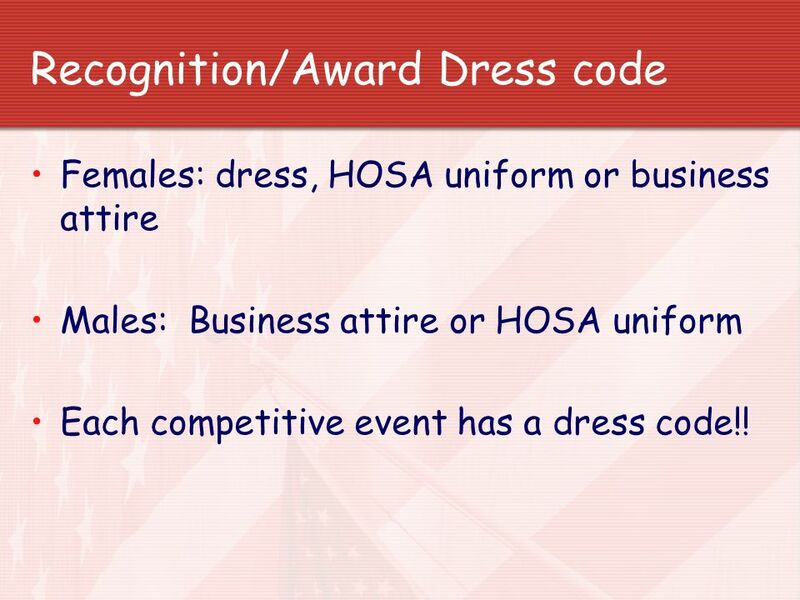 Females: dress, HOSA uniform or business attire Males: Business attire or HOSA uniform Each competitive event has a dress code!! 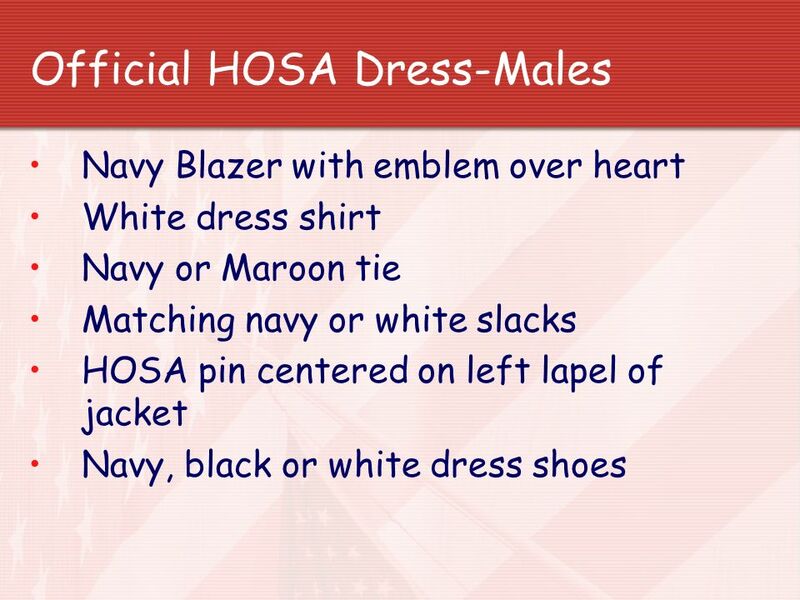 21 Why HOSA? 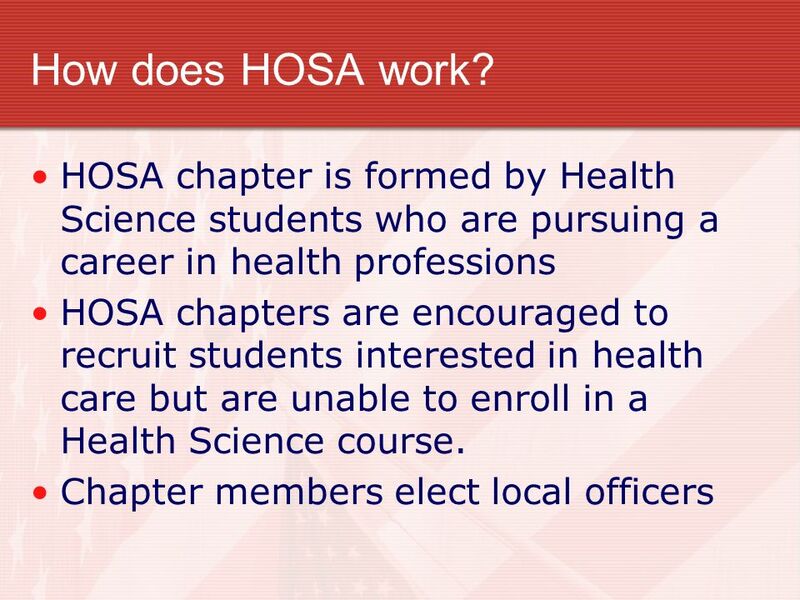 The Health Science instructors serve as the HOSA chapter advisor. 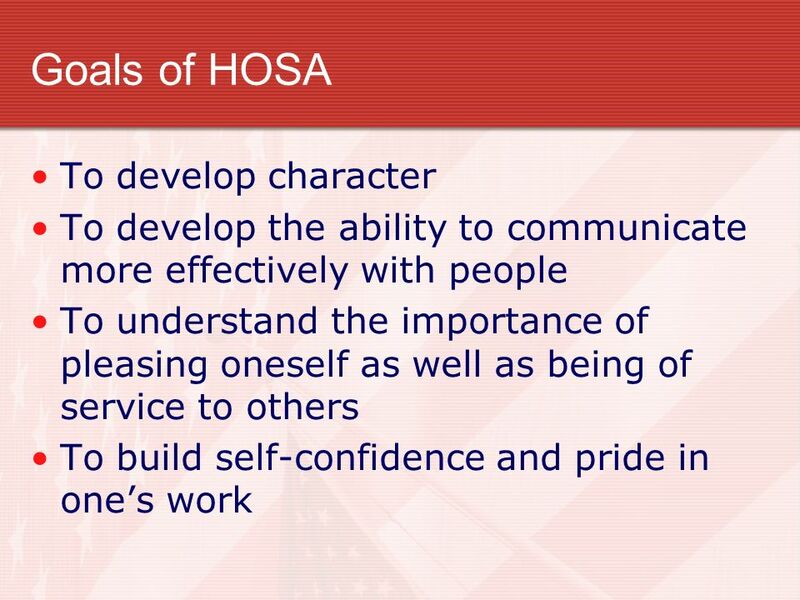 HOSA members practice, refine and seek recognition for skills gained in the Health Science classroom. 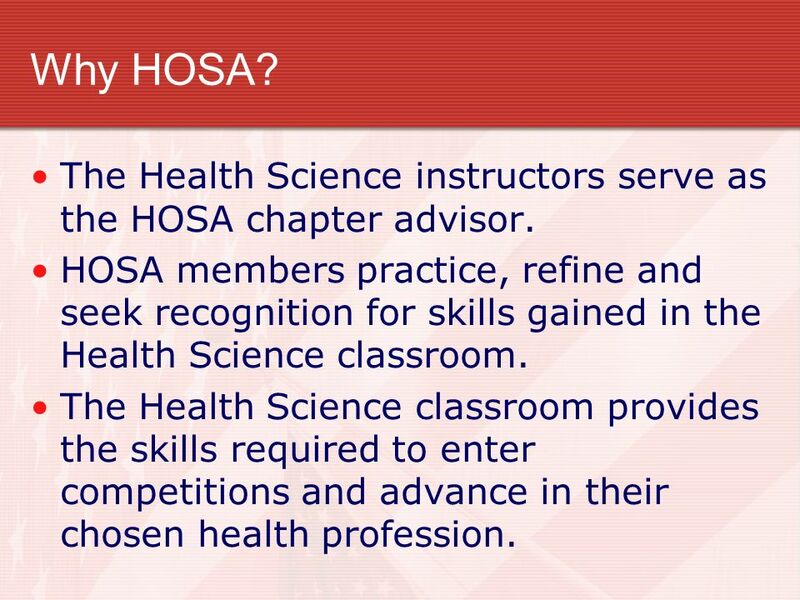 The Health Science classroom provides the skills required to enter competitions and advance in their chosen health profession. 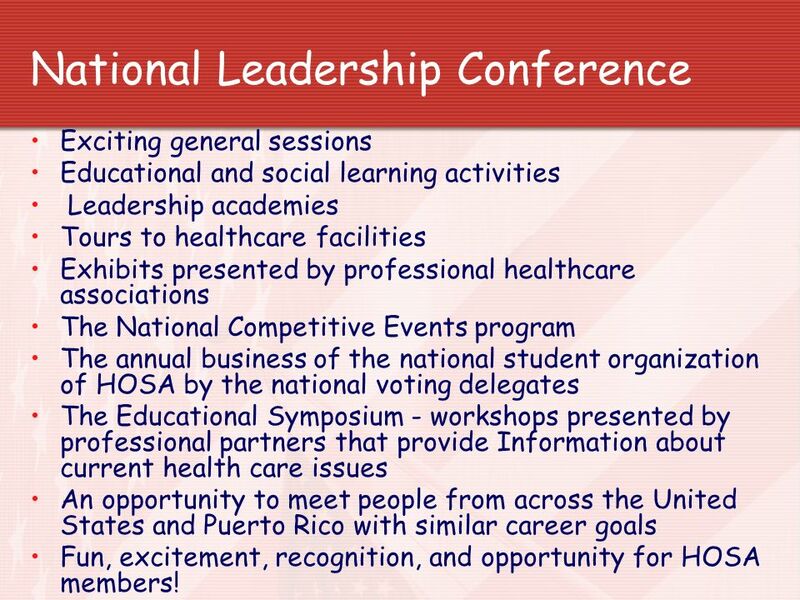 Exciting general sessions Educational and social learning activities Leadership academies Tours to healthcare facilities Exhibits presented by professional healthcare associations The National Competitive Events program The annual business of the national student organization of HOSA by the national voting delegates The Educational Symposium - workshops presented by professional partners that provide Information about current health care issues An opportunity to meet people from across the United States and Puerto Rico with similar career goals Fun, excitement, recognition, and opportunity for HOSA members! 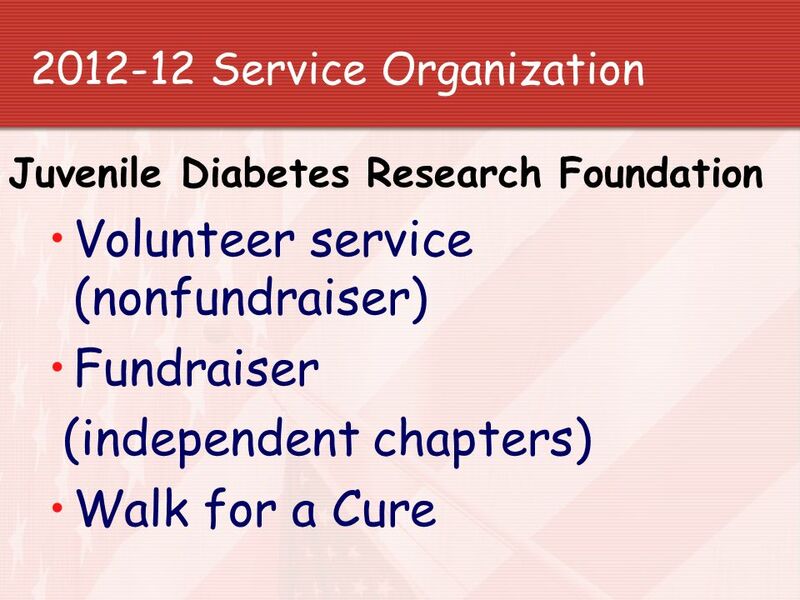 41 This organization opens the door for many medical opportunities as well as training the students in some of the advantages and problems that they will face in medical careers. 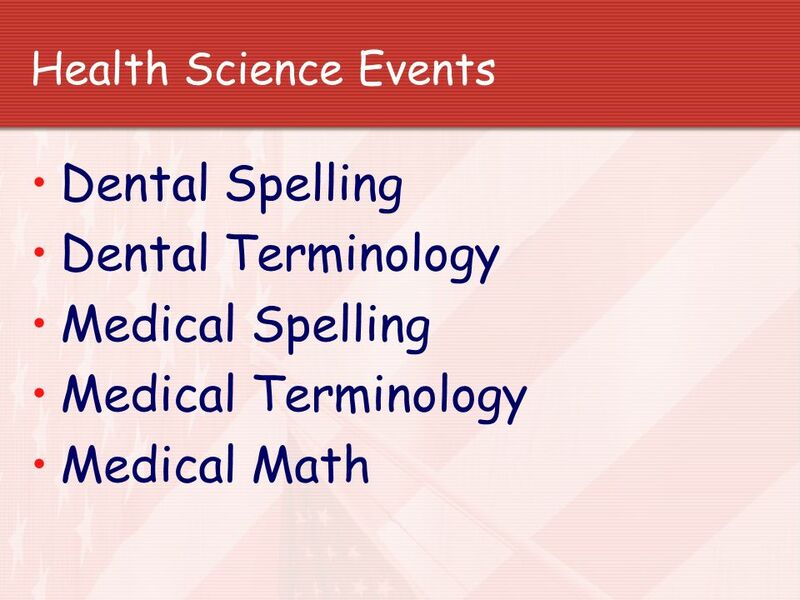 HEALTH SCIENCE TECHNOLOGY EXPLORE THE OPPORTUNITIES. 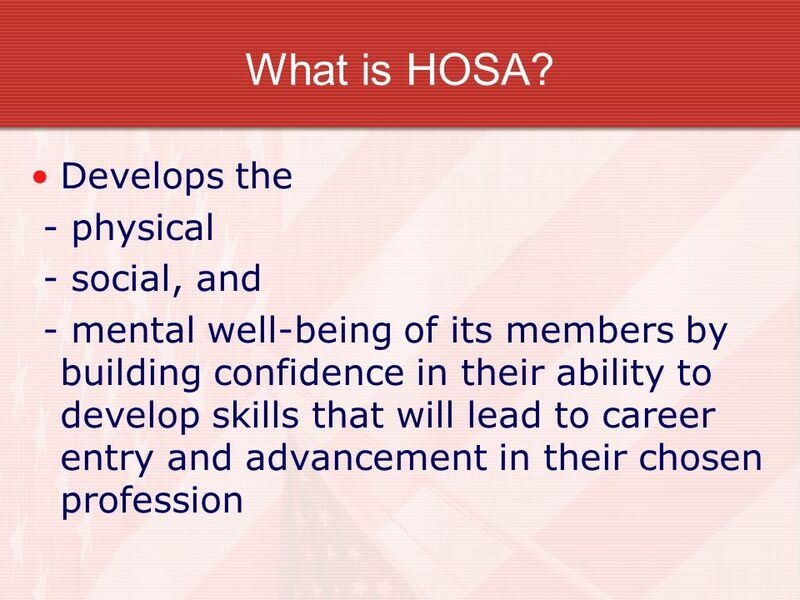 Meet Future Health Leaders >Introduce HOSA-Future Health Professionals as an example of an organization that can contribute to the health professions pipeline. 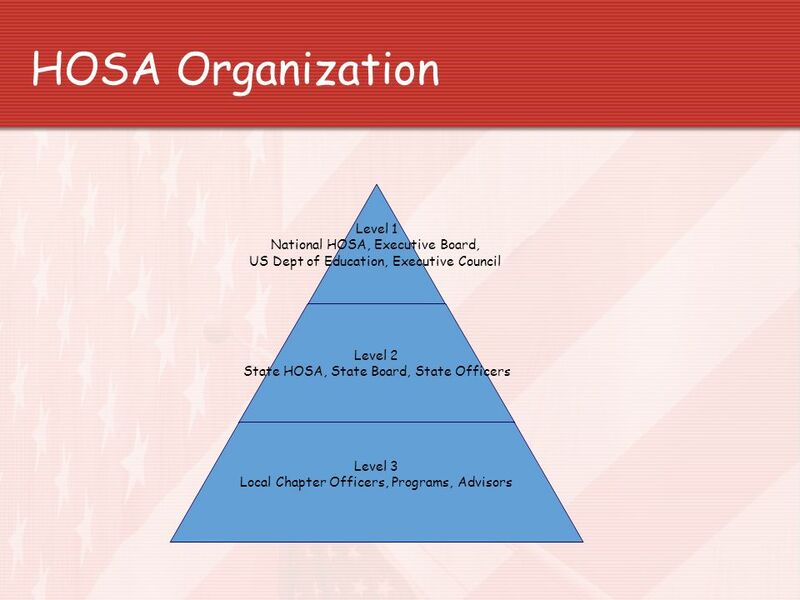 Promoting Healthy Partnerships Introducing HOSA. 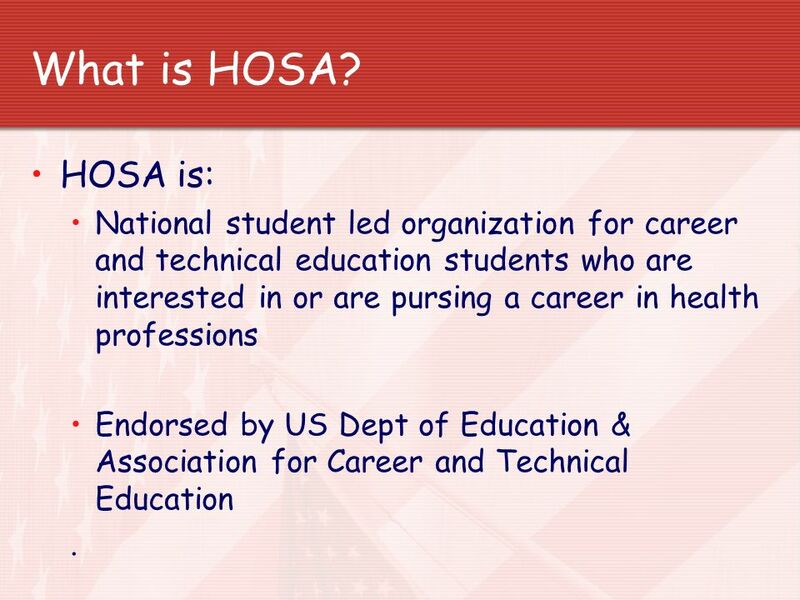 HOSA A student-led organization with a program of work designed to recruit qualified students, provide. 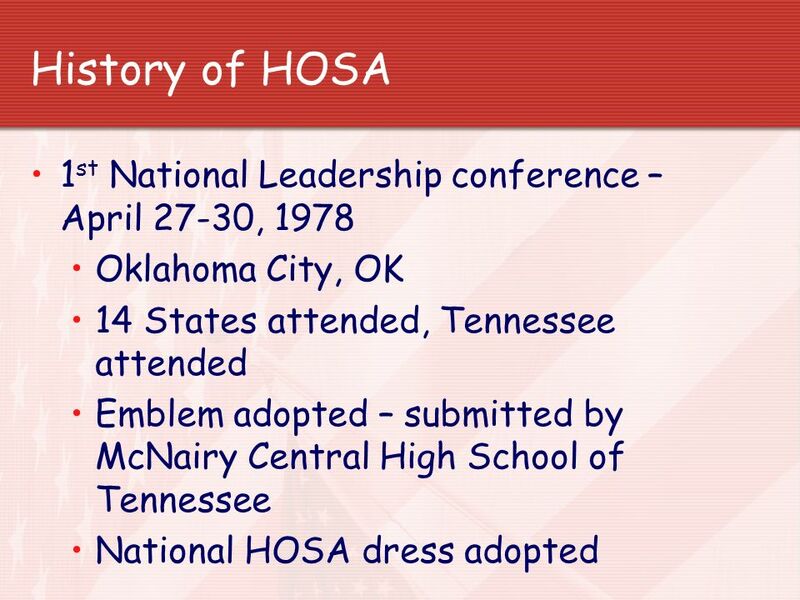 HOSA Health Occupations Students of America n A program of student-led activities relating to Health Occupations Education designed to develop future. 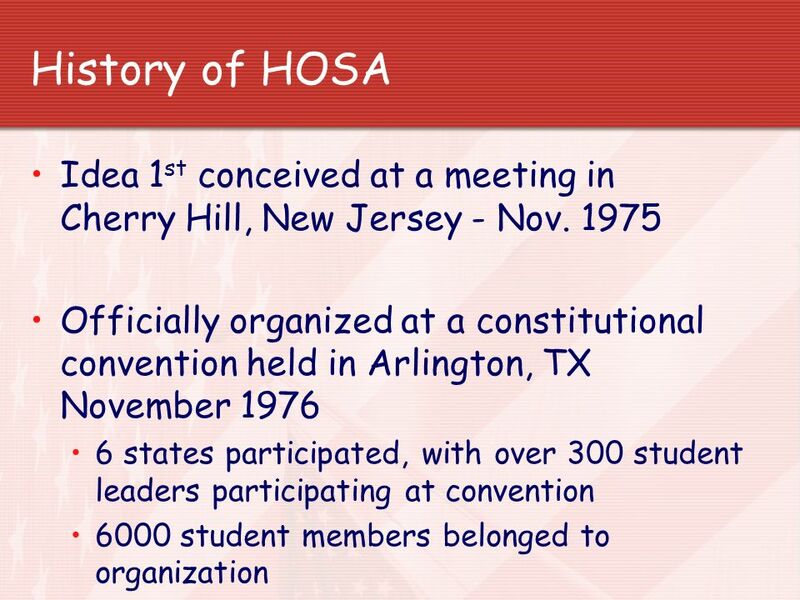 Promoting Healthy Partnerships Introducing HOSA 6021 Morriss Road, Suite 111 Flower Mound, TX Tel Fax HOSA. 1 SkillsUSA Champions at Work. 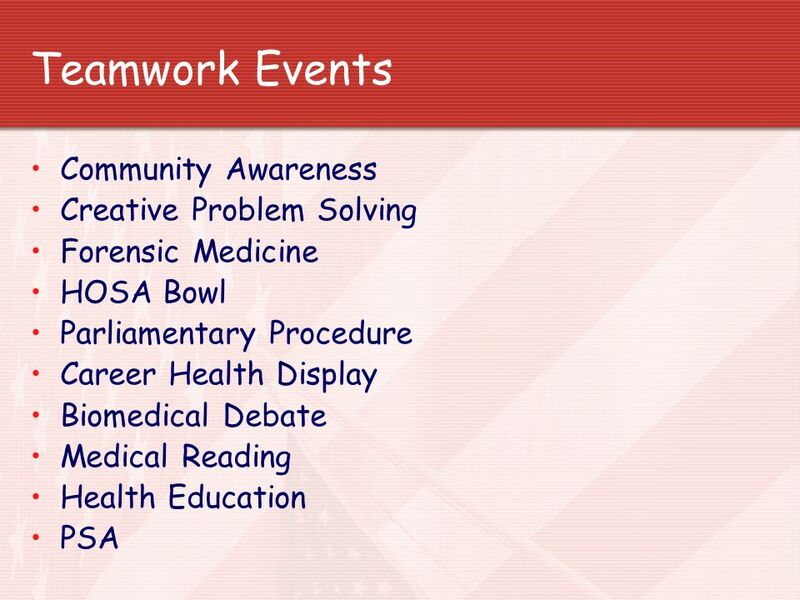 SkillsUSA Preparing students for career opportunities through CTSO involvement The Challenge The Facts The Solution. 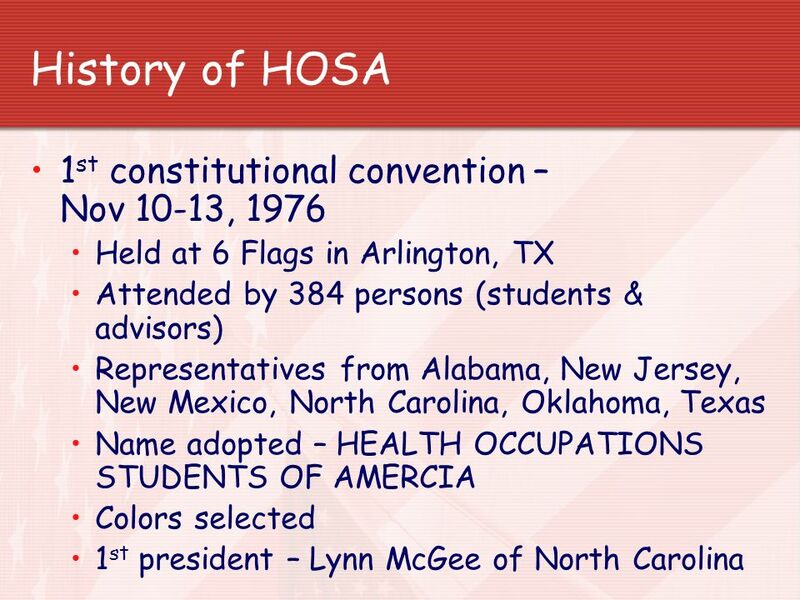 TODAY’S FFA Original PowerPoint by Lowndes High FFA Modified by Georgia Agricultural Education Curriculum Office July, 2002. 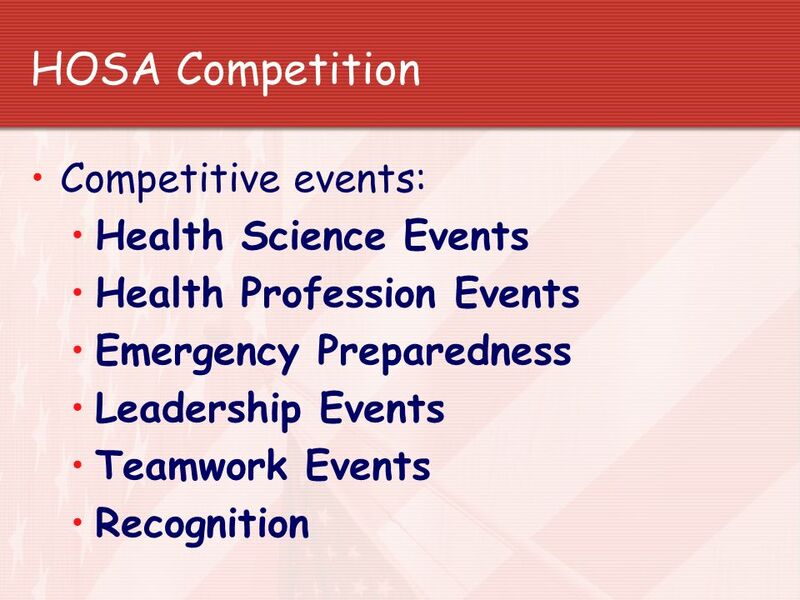 Competitive Events Program Provides a system for recognizing excellence in performance of knowledge and skills developed by members through Provides a. 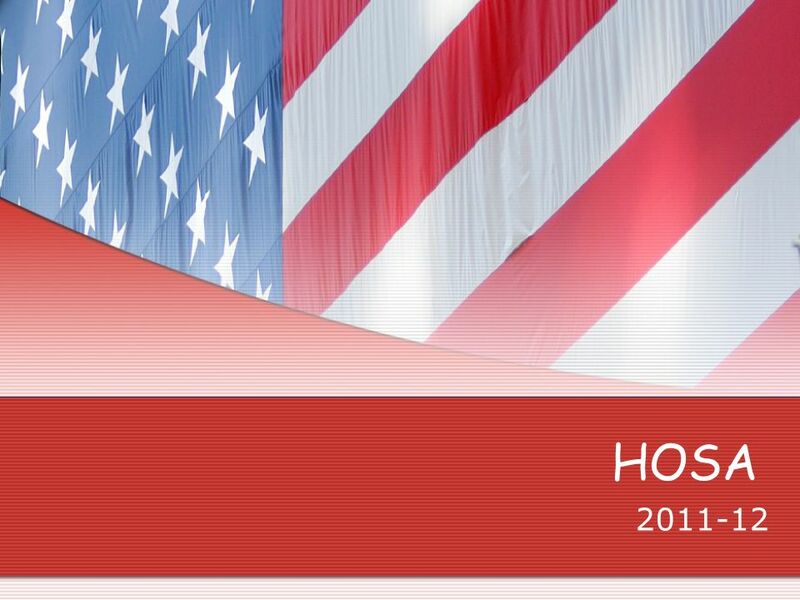 Red White FCCLA FLOWER FCCLA Colors Symbolizes Strength Courage and Determination White Symbolizes Sincerity of Purpose and Integrity of Action. The National FFA Organization Introduction to World Agriculture. 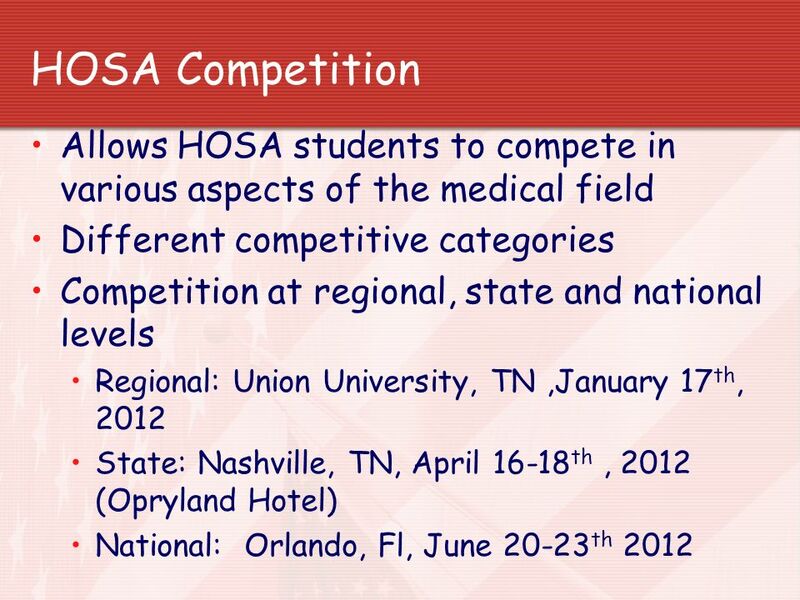 National HOSA Promotional Video What it is?? 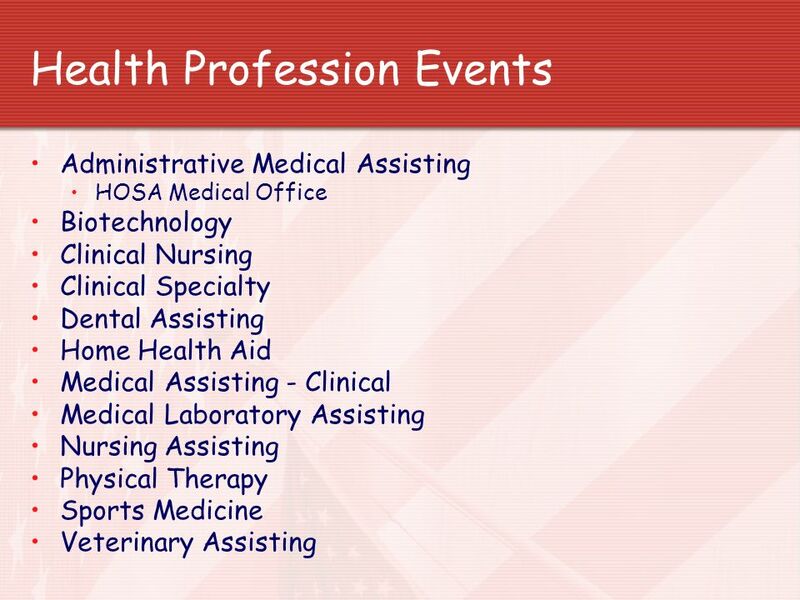 O Heath Occupation Students of America- Future Heath Professionals O One of ten national career and technology. 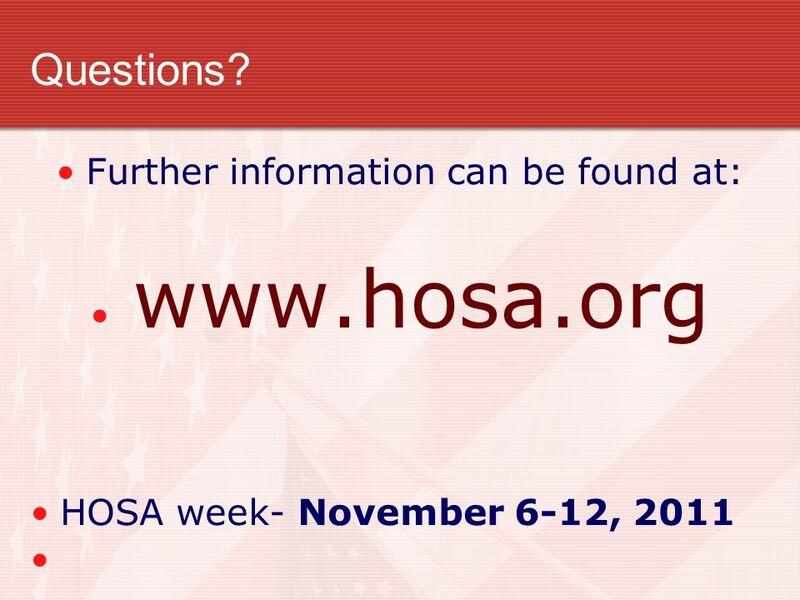 HOSA – What’s It All About? 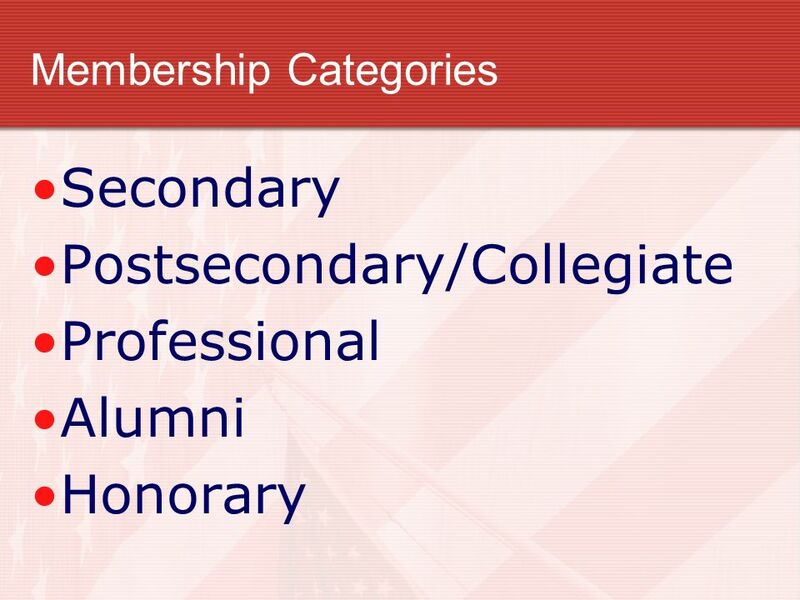  Leadership  Scholarships  Networking  Resume building  Competition Opportunities. 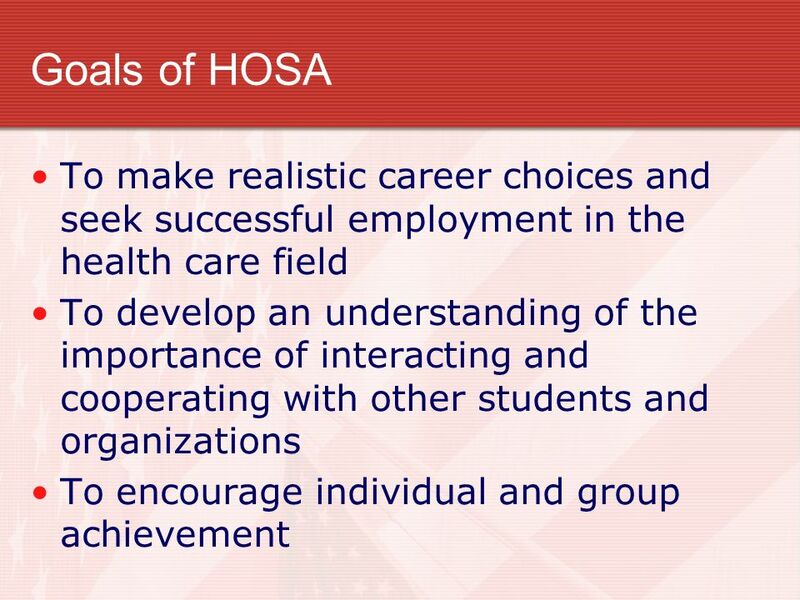 Objective: Determine how HOSA is beneficial to the student Essential Question: Why is HOSA membership beneficial? 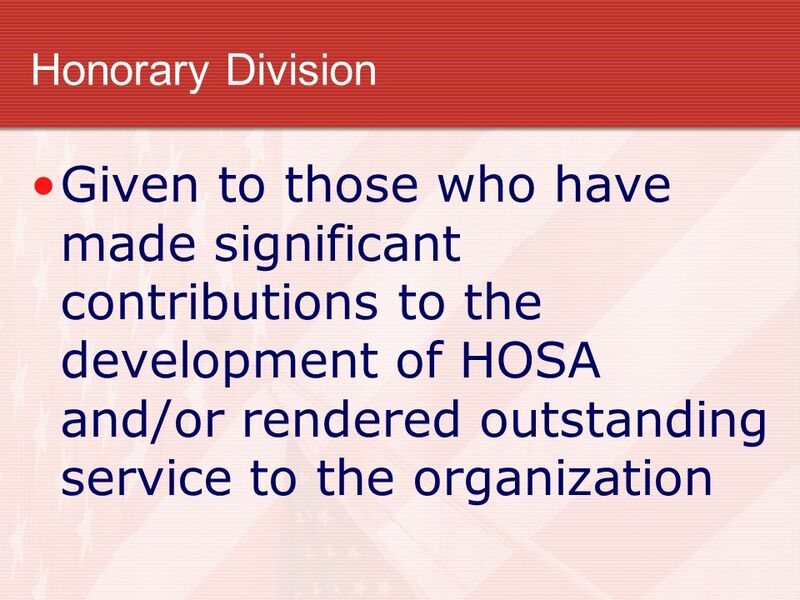 Warm up: What does the acronym HOSA stand. 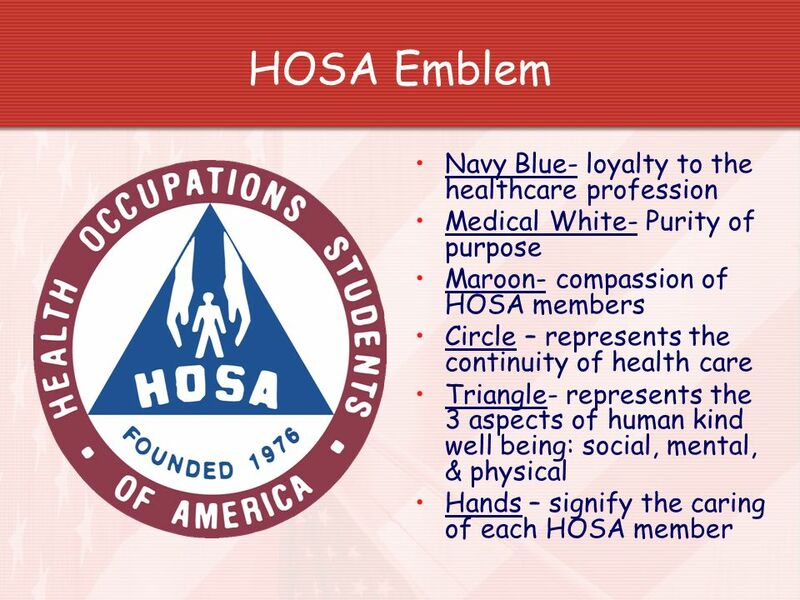 Health Occupations Students of America A student-led professional association A student-led professional association Endorsed by the US Department of Education. 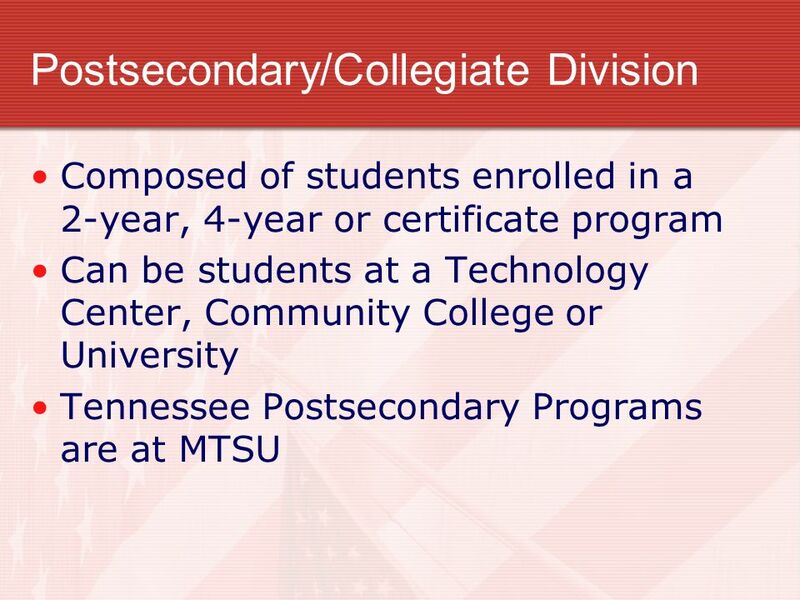 Committed to Building a Pipeline of Future Health Care Professionals. Exploring the History and Organization of FFA. 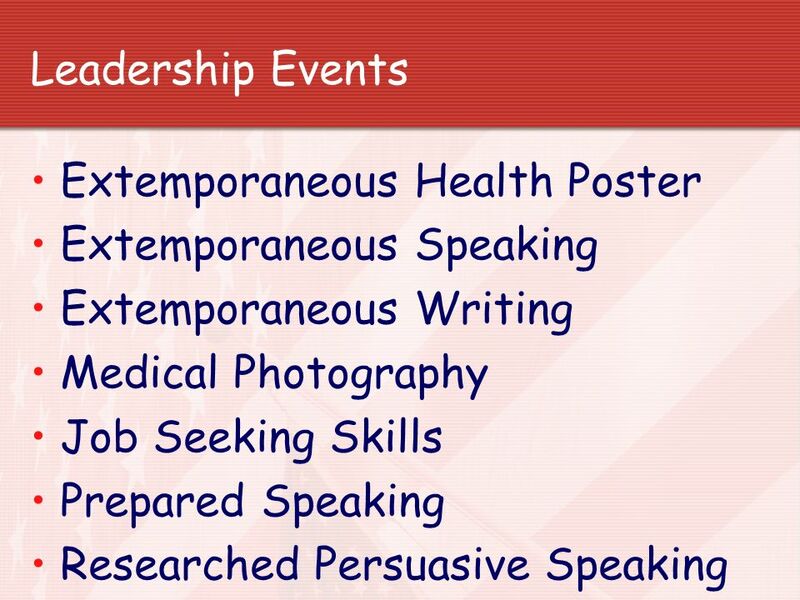 Student Learning Objectives   1. 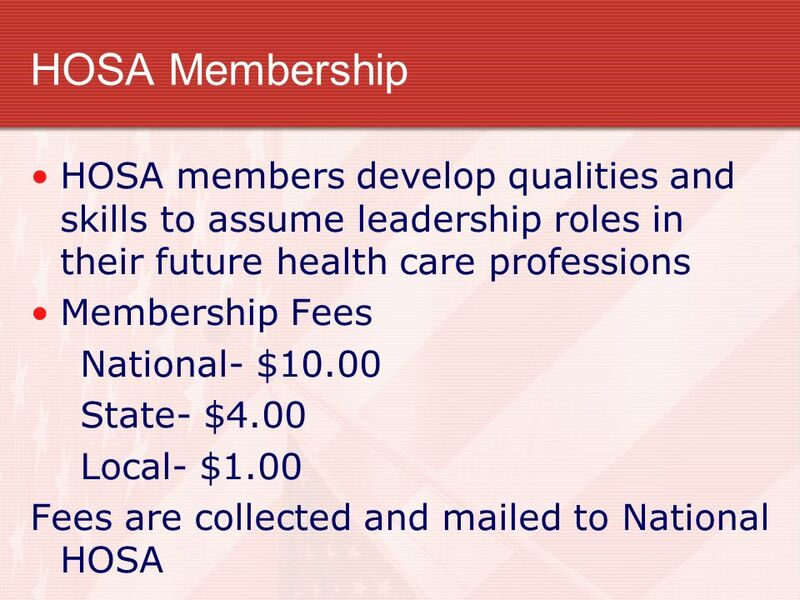 Explain how, when, and why the FFA was organized.   2. Explain the.